Chatterboxes will take place every Wednesday throughout August at 11:30am and 1:30pm and are suitable for children of all ages. Children must be accompanied by an adult at all times. These events are free on admission (usual admission charges apply). Hastings and St Leonards are served by the Stagecoach bus company, who run regular services from nearby towns and villages. There are regular train services that run from London Victoria and London Charing Cross to Hastings. Direct trains to Hastings from Brighton and Ashford International run twice an hour. Join Jerwood Gallery's Learning Coordinator, Tom Curteis, for an interactive dialogue of discovery. 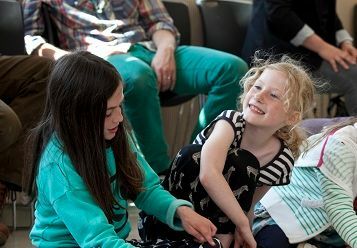 Using the inspirational environment of the gallery and the contents of a precious treasure chest, children and their families are invited to interpret paintings in a playful and open way.